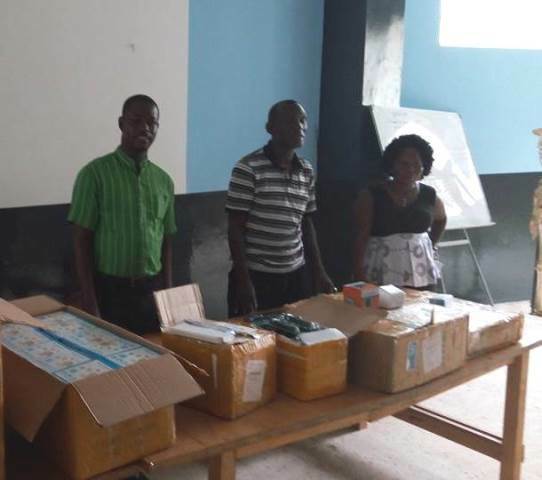 The students of the A.M. Dogliotti College at the University of Liberia were the happiest recipients of medical equipment from I-Help Liberia U.S. based NGO aimed at helping the students to boost their medical skills of the students in their bid to acquire sound medical education at the University. According to Mr. Abraham Jabateh, I-Help Liberia Executive Director, said the arrival of these medical equipment which included Blood Pressure Cuffs, Pulsei Oximeter, Patella Harmener, Stealth’s Cope, Thermometer and Ophthalmoscope all numbered fifty pieces was made possible through the help of Ms. Heidi Baumgartner, a founding member of I-Help Liberia USA, and a alumina of Hunter College High School in New York, Manhattan, the United States of America. Making the presentation to the students at a colorful and well attended program in presence of Richard J. Doe 5th year Class President, Mr. Thomas S. Kpengba; 2nd year Class President and the President of the Liberia Medical Students Association, Mr. John S. Yargrorble, Dr. Gassima Kaba praised the leadership of I-Help Liberia USA for the donation, and also urged beneficiaries of the items to use them wisely, President e United States. Speaking on behalf of the Ministry of Education, the Director of Science at the ministry, Ms. Sangay Faeflen, lauded the management team of I-Help Liberia USA team, especially its founder, Mr. Asumana Jabateh Randolph for his farsightedness in seen the Liberian educational improving to its best, and also called on the students to utilize the items being presented to them. In receiving the items, the President of the Liberia Medical Students Association, Mr. Yargrogble expressed thanks and appreciation to I-Help Liberia for the gifts, and assured of the proper usage of them by the students.